In her latest column for BBC Wales Sport, Seattle Reign midfielder Jess Fishlock looks back at Wales women's Euro 2017 qualifier in Kazakhstan. We knew that our hopes of qualifying for Euro 2017 rested on getting a positive result in Kazakhstan and we we really pleased to get the job done. We needed to get the three points to keep the campaign alive and did so with a 4-0 win. Only the eight group winners and six best runners-up are guaranteed automatic qualification to the 2017 tournament in the Netherlands and we are currently third and looking to make up ground. Had we slipped up against Kazakhstan, we would have been in a difficult spot. You can only beat the team in front of you and this was a good result. Considering the conditions out there, it is a testament to the preparation we had, it was a very well-played and professional performance from the girls. We are still competitive in the group and we have three games left and are looking for three wins. We have a big game in June against Norway and then a huge double-header with Israel and Austria. We want to win them all, we definitely need to win at least two out of three. But I am confident in the girls and we have to keep believing, we keep getting stronger and stronger as the campaign goes on. There was a lot of travel this time around. It was tough and especially at this time of year, because a couple of days after I get back to Seattle, the new season starts. For footballers these are factors and, for some of the girls, their travel ended up exceeding 24 hours. For myself, the trip from Seattle added about 20-hours to the rest of the journey. I flew from Seattle to London and then on to Cardiff from London to meet up with the squad. We then went from Cardiff to London, then from London to Moscow, Moscow to Shymkent, which is in the south of the country and then we drove to where our hotel was. Then on the way back it was Shymkent to Astana, then Astana to Frankfurt, and then Frankfurt to London. Then most of the girls went from London to Cardiff. That's around 24-hours. I stayed in London and got a hotel in preparation for my flight back to Seattle to play in the season opener. It can only be passion for your country can't it? I am not going to lie, before I got on that flight to London from Seattle I did think 'this is going to be a long week'. But for all the girls to play for Wales, we have to have that drive and passion to play for our country. For me that's what it is. It is still like the first time. That excitement makes me like a little child. We know how much the success of the men's team has resonated with the public and we feel that buzz, that excitement. When we get together in the Wales camp, we will be talking to the admin people and the backroom people, asking them 'what are you doing for the Euros?' because it is just such a huge event. Everyone shares the excitement. We can't go and support them because it is during the season for us, but I will be watching the games, you can count on that! I will have a ringside seat to see if the Euros makes a big impact in the States. I will be sending out some tweets to find out which sports bars in Seattle have my boys on. To be honest, I don't think it will be too difficult. Plenty of people in Seattle will be following the tournament and I just hope I can convert a few of them to be Welsh for a few weeks. The season starts this weekend for me with Seattle and it is always important in a new season to make a good start. I am really excited to get back to Seattle actually, we have had a very good and successful week with Wales, so I can go back in a good place. 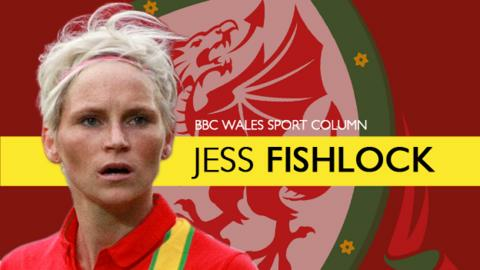 Jess Fishlock was talking to BBC Wales Sport's Michael Pearlman.